We bought a home in town, after being in our beautiful country home for 32 years. This brought mountains of paperwork, as you can imagine. Then, I spent some time in the hospital with a strange form of pneumonia. I'm still very weak. If I get through one small task, I have to take a nap. We will close on the new home on the 12th. The work begins on the new home, getting it ready to move into. Once that's done, clean up and repairs begin on our country home. Anyway, I will probably be popping in and out from time to time, but first priority for me is getting my health back. I was apparently a very sick gal. I will, of course try to keep up with my Scor-Pal requirements after June! Here I am with yet another 30 Day Coloring Challenge post. Last week, when I posted my deer card on Facebook, I received an order for a set of six deer cards. Hope you are having a good week - ours has been SO busy! Take care, and thanks for dropping by! Shirley, Cheryl, Donna, Marian, and I went to Collinsville today to a stamp show - had a great time! Bought SO many fun things! Taylored Expressions was there this year, and Taylor is adorable! Their booth was manned with knowledgeable, helpful, and plentiful staff, both on the floor, and at the registers. Yay, TE! High point of the day was getting to meet Vicki Parson, a blogging friend, and her mom Doris! We met and went to lunch together. Had a wonderful visit, and I'm already looking forward to next year's show, and getting to see them again! Vicki is incredibly sweet and uber-talented! Here's my coloring for Day 9 of the 30 Day Coloring challenge! Have a great night, and a wonderful Sunday! This is a fun stamp set from Creative Visions Stamps. It was colored with Copic markers. It's Thursday, and I'm looking forward to the weekend. How about you? Funny how I still look forward to those two days, even having been retired many years. Of course, THIS Saturday is our annual girl's day out to Collinsville, Il., for the yearly stamp show. Be still my heart! New treasures to look forward to, and a whole day with good friends! This is a digital image from Power Poppy, called 'Layer Cake'. Have you ever been to Power Poppy and looked at Marcella's gorgeous flowers? Oh my goodness, they are a dream to work with! 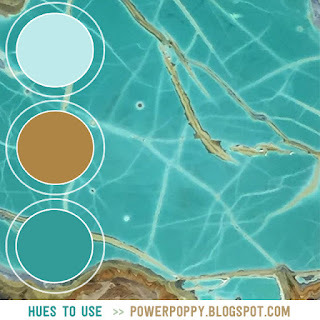 I'm going to enter this in the Hues to Use challenge at Power Poppy. Thanks for dropping by to visit, and support me in this coloring endeavor. I love to color, but coloring and posting 30 days in a row is stretching my brain! Seriously, I am SO surprised to be here typing this. Six days in a row have found me relaxing with a coloring medium in hand! I'm loving this - can't wait for tomorrow! Here is my coloring for Day 6 of the 30 Day Coloring Challenge. It's a fun little Penny Black image called Beach Baby. I've added polka dots to her swimsuit, drawn stripes on her towel, and added some water, birds and sand. I think she's darling, and couldn't resist giving her a bit of sunburn. That's what is ALWAYS my result when I get out in the sun! Bet you didn't expect to see me back today. To be honest, I'm really wondering how I'll make it through 30 days - YIKES! Anyway, here is my coloring for Day 5 of the 30 Day Coloring Challenge. It's a sweet Art Impressions stamp. Hope you like it! I got to spend today with my bestie - we got pedicures, had lunch, and picked up a few groceries. It was a great morning!!! I'm entering this in the Word Art Wednesday challenge Weeks #336-337 - Anything Goes. This sweet little image was on a 12 x 12 sheet of images that I bought in Collinsville, Il., last summer at a Stamp Show. I don't know who the vendor was, but I am definitely going to look for some more of these sheets on June 9th, when I go again to the show! Hopefully, I haven't bored you to tears. I'm quite proud that I've colored three days in a row! Going to try to create tomorrow, as well! It skipped spring and went right to summer Missouri. That's okay with me, as I'm always cold! It's time for a new challenge on the Scor-Pal blog - 'Pretty in Pink'. Creations need to include more than one fold, and the 'Pretty in Pink' theme. This cute little box is holding two Vanilla scented candles. Pretty cute, right? I'm hoping the recipient will like it! If you check back here on the 15th, I'll show you how to make these! For this project, I used my Scor-Pal Eighths, & 1/2" Scor-Tape. I hope to see your creations in our monthly Scor-Pal challenge!